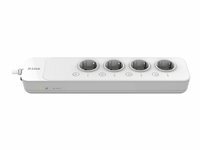 A 4-port wireless power strip that is ideal for those taking the first steps to making a home smarter and more secure. Once connected to the home Wi-Fi network, the smart power strip can be monitored and managed via the mydlink Home app. This enables consumers to use the mydlink home app to set up simple recipies to safely switch control equipment, for example switching off all AV equipment with a single click at night.